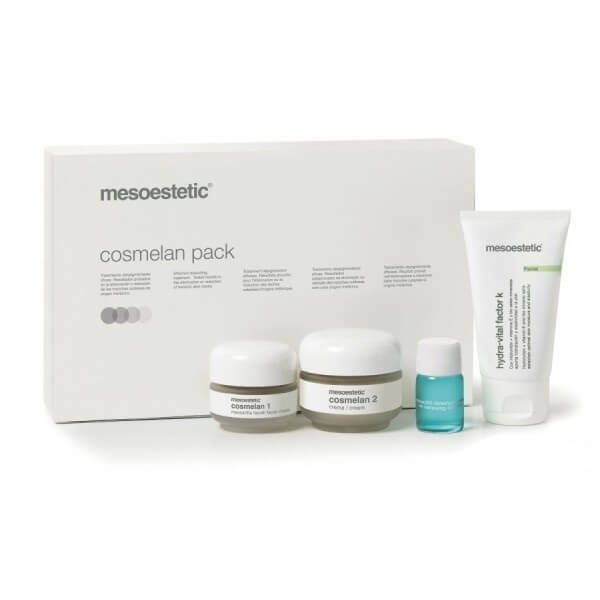 Cosmelan is an extremely effective method of removing dye spots of different etiologies, including the type of melasma. This treatment also regulates the sebum production and stimulates the regeneration of collagen, which consequently leads to the distinct effect of rejuvenating the skin. The course of treatment with Cosmelan is adjusted by a physician conducting it to the individual needs of each patient and a long period of its usage depends on the skin phototype and on the intensity degree of the existing discolorations. The course of treatment: The procedure of the treatment consists of two stages. The first is being performed in the doctor’s surgery and involves degreasing the skin and applying the mask from the Cosmelan 1 preparation, which then is being washed off by the patient at home. It also involves acquainting the patient with the principles of operating and the next stages of the procedure. After the treatment, a therapy is being continued at home, by applying the Cosmelan 2 cream for a period of minimum three weeks. The achieved results: The treatment may be performed at any time of the year, but requires the use of creams with UV filters of high protection rate. In 99% of cases the intensity degree of the colouring spots is reduced by 95%. The full effect is noticeable after approximately 30 days.